Our Product and Marketing Assistant Sandra, who is currently working in our Peru office, spent a wonderful weekend at Huacachina on the Peruvian coast and this is her story. Sat in cold and wet London we’re not jealous… much! Imagine…it is 6 o’clock in the evening and you are sat at the top of a giant sand dune watching the sunset over a breathtaking landscape, where golden yellows, rusty reds and pinks blend with each other. Below lies an oasis with a desert lagoon surrounded by exotic palm trees. It took thirty exhausting minutes to climb the sand dune. I spent the entire climb trying to convince my friend that we didn’t need to go all the way to the top, the view from the middle would be just as good. It was serious work out for the thighs! But her stubbornness was in the end our gain. Pull yourself together and get up that dune! I promise, every welding sputter will be worth it when you see the the view she said. And my goodness, she was right! Huacachina is a tiny town in southern Peru, around five hours from Lima. I had always wanted to see it for myself. Unfortunately I missed out when I was travelling through Peru for the first time last year. I am now working at the Chimu office in Lima, so Huacachina seemed like the perfect little getaway for the weekend. My friend and I took the Cruz del Sur Bus on Saturday morning from Lima and travelled south. It is a five hour journey by bus to Ica and then a ten minute drive on to Huacachina. 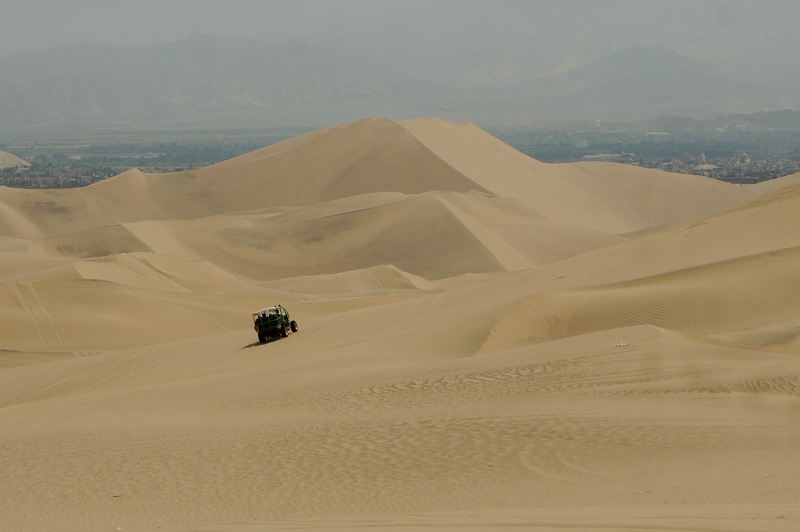 Tourists visit Huacachina for three reasons: the beauty of the desert with its massive sand dunes, the opportunity to sand board and to ride around in one of the four-wheel-drive dune buggies that whiz up and down the dunes at a breakneck-speed. You can certainly count on having a lot of fun when you visit this little Oasis. The town is quite small and visitors can easily get from one end to the other in a few minutes. Right in the centre there is a huge lagoon surrounded by palm trees and huarangos trees. You can hire paddle-boats or swim in the lagoon… but be aware of the mermaid! According to legend, a mermaid lives in the lagoon and takes one man each year. I think, however that certain Peruvians inability to swim is a more feasible explanation of the yearly drowning! Climbing to the top of one of the dunes for the amazing views of both the gorgeous lagoon and the city is an absolute must! It is simply mesmerizing! I would recommend setting off a good hour before sunset, particularly if you have similar fitness to me (virtually non-existent). Take plenty of water, your camera , maybe a cold beer (which will be warm by the time you get up there anyway, but better than nothing right?) and maybe a scarf to protect yourself from the wind. You will notice that it is a common ritual to finish the day on top of the dunes. After that, we jumped, rolled and fell back down 400 meters, back to our hotel. dunes are the most fun! After some speeding fun, we drove to the top of a dune so we could do some sand boarding. I would suggest renting a real snowboard, with the right gear, so your feet are properly attached to the board. This way you are able to do turns. Before booking a tour, remember to mention this to your tour guide, otherwise they give you a ‘Chile board’ which is basically just a wooden board and with nothing to attach your feet to. Sand boarding is a lot of fun for everybody, whatever your age or fitness. If you fall, the worst thing that can happen is that you might need a bit more time in the shower, removing the sand from every possible corner of your body! After two days we headed back to Lima feeling pretty miserable. 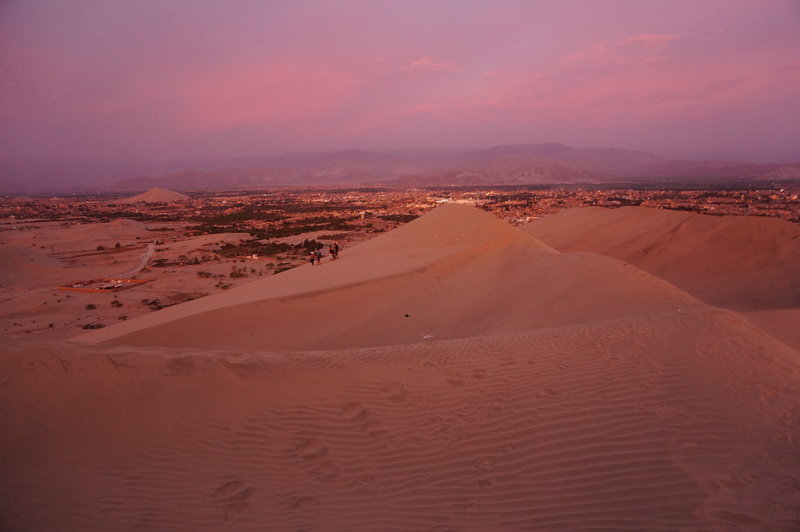 Huacachina is such a chilled little oasis with so much to offer. 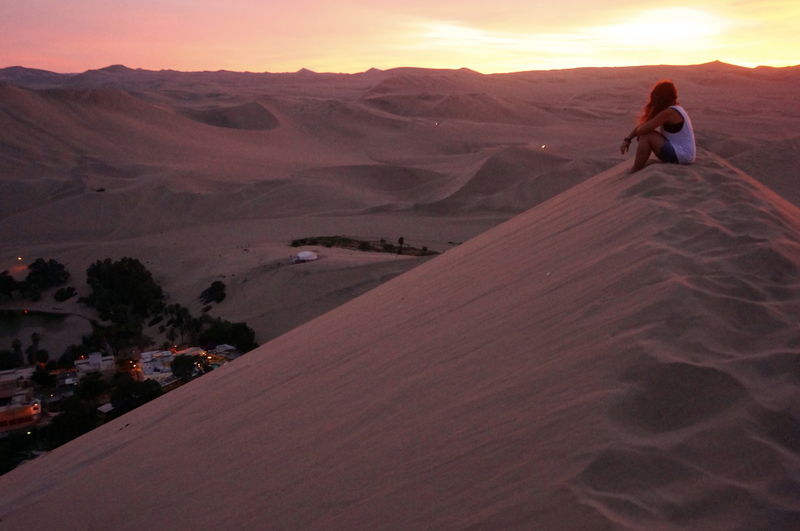 When planning your trip to Peru, don’t forget to put Huacachina on your list.